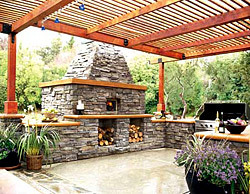 The addition of an outdoor kitchen has become one of the most popular outdoor living projects requested in recent years. At Krefta Landscaping we have found that more and more property owners are utilizing all the space they have to benefit their lifestyles. It makes perfect sense too. 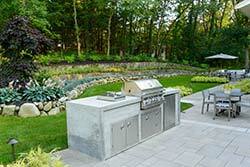 Why have outdoor space just sitting there doing nothing when you could add a n outdoor kitchen and BBQ? This will change the way you use your outdoor areas for good. 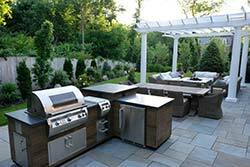 We have been designing and installing great outdoor kitchens and BBQ's throughout the greater Eastern Massachusetts region with immense success. Our teams of professional landscape designers and contractors have created innovative and stylish outdoor living areas for both our residential and commercial clients. So, let us change the way you use your landscape areas and start doing some entertaining! At Krefta Landscaping we will custom design and build you an outdoor kitchen that is perfect for your needs and for the space you have available. Our experienced team of landscape designers will sit down with you and come up with the best design for your cooking requirements and for your budget. 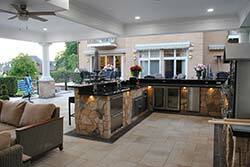 It is our goal is to take your outdoor kitchen visions and make them come to fruition. Your kitchen design can be as simple or as complex as you like. We can things like, kitchen islands, countertops, storage cabinets, sinks, taps, ovens and range hoods. There really are no limits when it comes to an outdoor kitchen; you can replicate your indoor kitchen if you choose too. We can install any product from the Harmony Outdoor Living range or we can custom design and install an outdoor kitchen from scratch! When it comes to BBQ's there are many choices to be made. You can buy a BBQ and we can make it fit into the outdoor kitchen we have built for you. Or we can build you a BBQ island and simple incorporate the grills into it. If you are having a stone kitchen then we can build your BBQ into the design also. BBQ's are a timeless piece of outdoor equipment that will get a lot of use all year round. If you love entertaining and having friends over for some great meals then the addition of an outdoor kitchen and BBQ is definitely a win win situation for you. So let the team at Krefta Landscaping enhance your social life and bring some great times to you and your property. We will turn your landscapes into an entertainer's hub. Contact us today and we will get you cooking up a storm in your outdoor spaces!